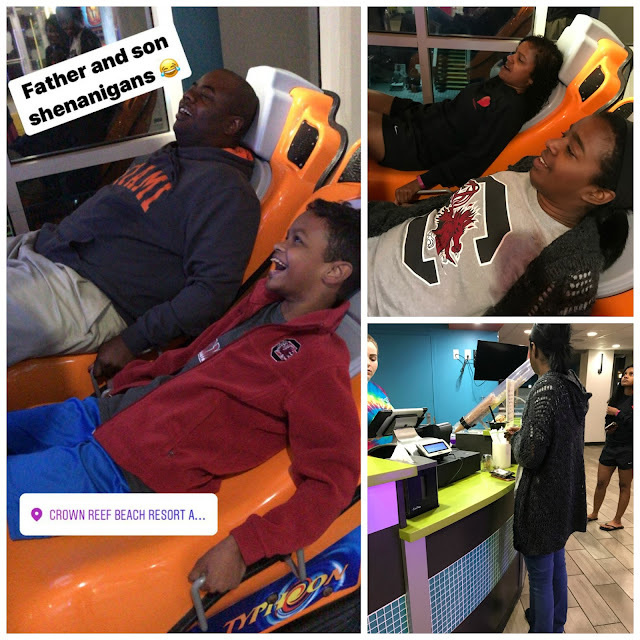 Although the weather is cooling down quite a bit, it never stops my family from traveling to Myrtle Beach. The beach is my family's happy place, and not matter the weather, you can find us there numerous times throughout the year. Our favorite months to visit are between November-March during the off-season. Most people assume because it's colder during that time, that we are nuts. What they don't realize is that Myrtle Beach has so much to offer year 'round. 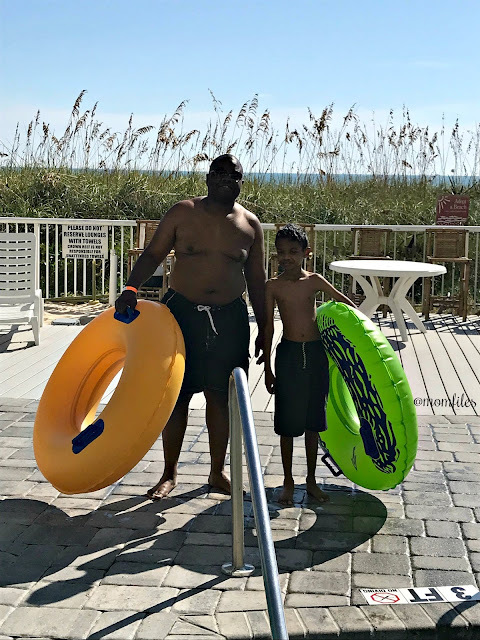 Our latest Myrtle Beach adventure landed us at the Crown Reef Resort & Waterpark. When we first pulled up to the resort, we were in shock by how enormous the property was. Check-in is done across the street at their conference center. The process was very quick, and the staff members were quite friendly and happy to answer all of our questions. We received our room keys, wristbands for the pool and waterpark, as well as a much needed map of the property, We headed back across the street to their oceanfront property to park in the covered garage. We stayed in the third building on the eleventh floor. It was the perfect spot that offered amazing panoramic views of the entire beach! 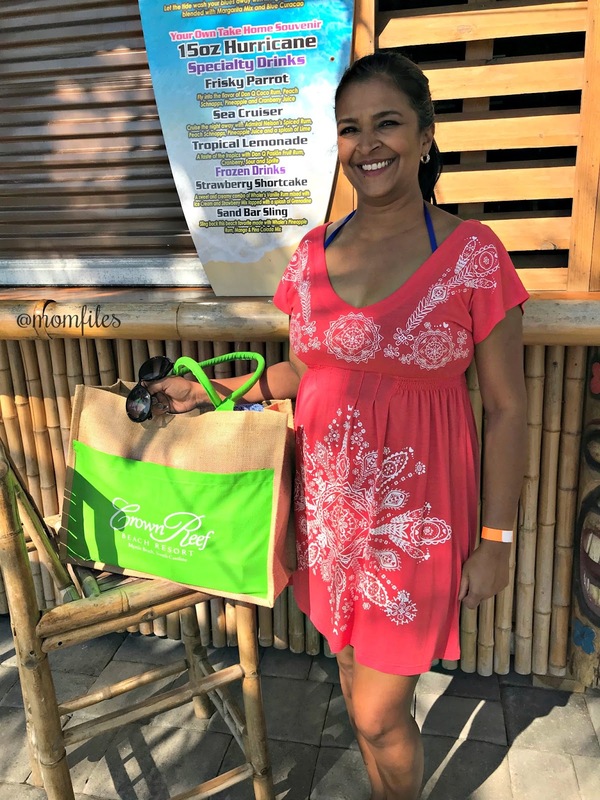 As we entered our oceanfront suite, we were greeting with a lovely beach bag filled with some goodies for my family. It was such a nice, personal touch! 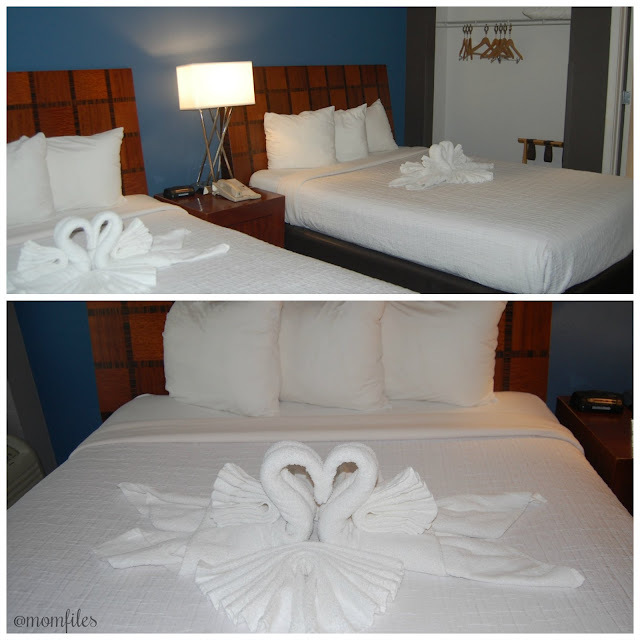 We immediately noticed the pretty towel swans that were placed on both of the queen beds in the bedroom. The bedroom was spacious and had plenty of storage space for our clothing and personal items. It had a flat screen television, as well as its own heating and air conditioning unit. There were ample pillows and extra blankets for the living area beds. As you leave the bedroom, you walk into the kitchen area with a full bathroom on the opposite side. The bathroom was a good size and it had ample vanity space, light, and a separate door for the toilet/shower area. I wasn't sure how 5 people were going to share the one bathroom, but we managed just fine. There were plenty of fresh towels available for us. We really loved the full kitchen. 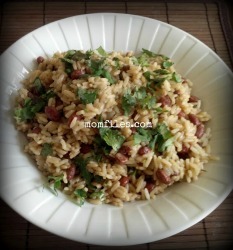 It helps a lot when you are traveling with a larger family since eating out can really add up. We brought some of our own groceries and made good use of all the appliances. It comes equipped with all of the basic pots, pans, dishware, utensils, and drinkware. It's like having a piece of home on vacation, and is such a great convenience. Once you exit the kitchen, you enter the living and dining area. The space was large enough for all of us to gather, yet had a warm and cozy feel. The sofa bed and murphy bed were perfect for extra sleeping space. This unit could sleep up to 8 people. Once you were up in the morning, all you had to do was push the bed back into the sofa and the murphy bed back up in the wall. Makes me want a murphy bed in my own house, because it is such a space saver. Let me tell you, the views are incredible. You can't get any better than standing out on your private balcony taking in the sights and sounds of the beautiful Atlantic Ocean. It's the best thing ever! Life has been so stressful lately, and just sitting out there looking at the moon at night and the sunrise in the morning was therapeutic. We didn't come all the way to Crown Reef Resort just to sit in our room, we came for some family fun. Having two adult children with their own busy lives, it's not often we get to all come together for some family time. We ventured around the property to check out all of the amenities, and were blown away. There is SO much to do to a point where you really have no reason to leave the resort at all. Crown Reef has so many beautiful pools, whirlpools, sun decks, and the longest lazy river in Myrtle Beach. I wish I had my waterproof cover on my phone so I could have taken some video while we were in there. It was awesome! During the warmer months, they have a walk-up poolside bar offering a variety of both alcoholic and non-alcoholic beverages. Whether you want a frosty hurricane or just a simple diet cola, they've got you covered. So as you're sipping on your beverage, you can listen to the sounds of the ocean while relaxing. 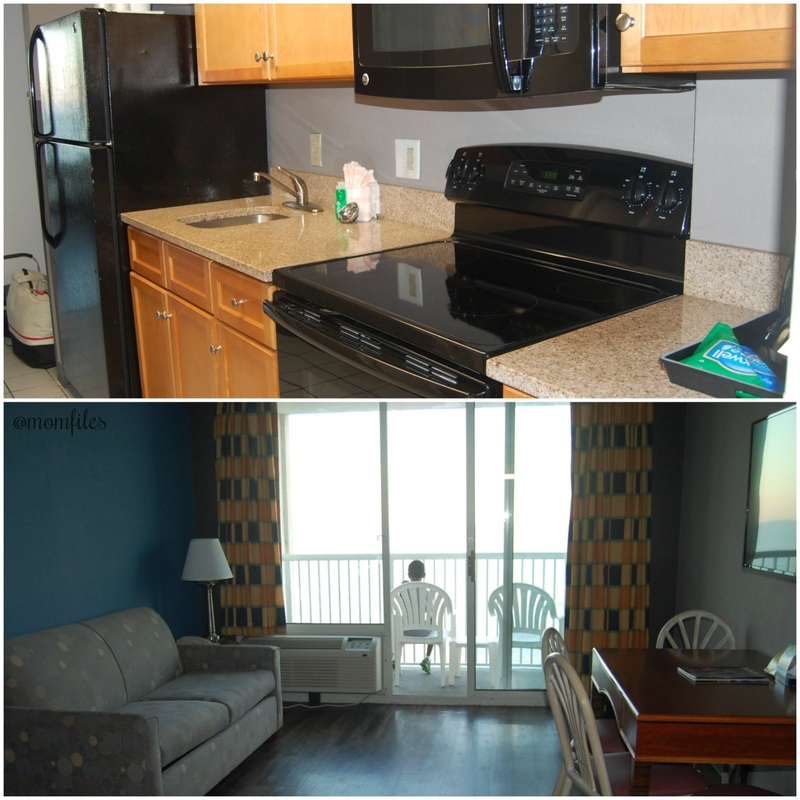 If privacy is more your thing, you can head up to the sun deck and enjoy the oceanfront views from above. The pool areas were all so beautiful and very well kept. We noticed a lot of friendly staff members everywhere we went. You can tell that a lot goes into running that place. They had so many patio chairs so there was ample space to accommodate a lot of people. I could totally see having birthday parties, graduation parties, or other big events there. It is very family friendly, so that is a plus. These two boys were so excited to hop into every one of the pools! One of the favorites of Crown Reef is the waterpark. The Crown Reef Resort Waterpark towers nearly 40 feet above the ground and features a 278-foot long two-person tube waterslide, a single-person 302-foot long waterslide and an 8-foot tall 20-foot long slide for the little ones! We put in a lot of steps that day making it up the stairs so we could slide over, and over again. The adults all felt like big kids. We all laughed ourselves to tears because we were having so much fun! And if the pools weren't enough, the arcade at The Town Center gave us even more giggles. They had so many fun games for all ages. My family enjoyed shooting some hoops, doing a little target practice, and some fun classic games like air hockey and skee-ball. There is a kiosk in the front of the arcade where you can load a game card right from your credit/debit card or by using cash. The girls stopped by the Swirl Ice Cream And Sweet Shop for a couples scoops of their favorite ice cream. If you're hungry and need a bite to eat, they have you covered for breakfast, lunch, and dinner. The Loco Gecko Beach Shack offers oceanfront dining for lunch and dinner. They have plenty of choices including burgers, sandwiches, salads, and wraps. They have a full bar, and even flat screen televisions where you could watch the game and feel the cool ocean breeze at the same time. They have these cool clear doors that can be lowered or raised like garage doors if it gets too chilly. The fact that they are clear does not obstruct your ocean views. 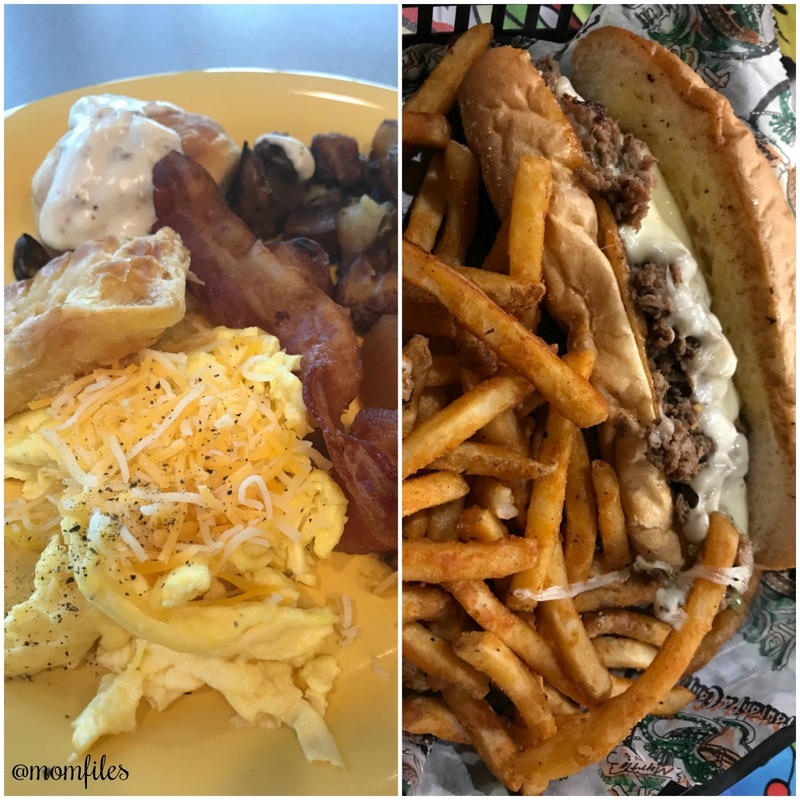 You can grab breakfast at the Grab n’ Go Grill and Coffee Bar. They have quite a spread with plenty of choices to satisfy everyone's taste. 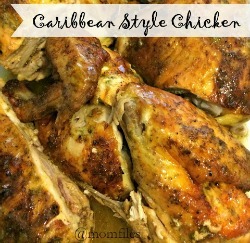 The service was excellent, and the staff was so friendly and attentive. It was so nice to enjoy my morning coffee and breakfast while looking out at the beautiful beach. Again, you really don't have to leave the resort if you don't want to. We stayed put our entire stay. Everything we needed was on site. They even offer laundry facilities, and have a little store where you can purchase snacks and other items. The beach access was much nicer and easier to maneuver compared to other places we have stayed. 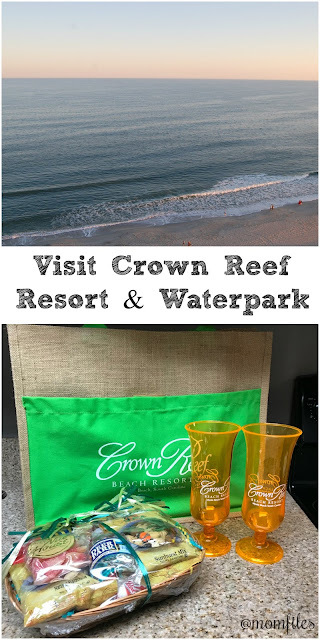 If you're thinking of a beach destination for an off-season vacation, Crown Reef Resort in Myrtle Beach is an excellent choice. The weather is a lot better than the northern states, and you will have to beach all to yourself (or so it feels). If you are a Groupon member, you can find some amazing deals for Crown Reef, so be sure to check it out. We were not disappointed with our stay, and look forward to going back early next year. Be sure to stop by the Crown Reef Resort site so you can book your vacation. Follow on Facebook, Instagram, and Twitter. Be warned: seeing all of the beautiful photos from the property will make you want to hop in your car and GO! Disclosure: Many thanks to Vacation Myrtle Beach and Crown Reef Resort & Waterpark for hosting our family. All opinions stated are my own.